The big surprise this weekend: Pa Biscuit realized he couldn't pass up the opportunity for four generations to be together and flew out to Michigan, literally hunted us down, and found us in Grandma's post-church restaurant. screaming bonkers when taken out. The flights went much better than I expected. I thought the changing pressure would just be horrible for someone who can't clear his ears, but it didn't seem to bother him. 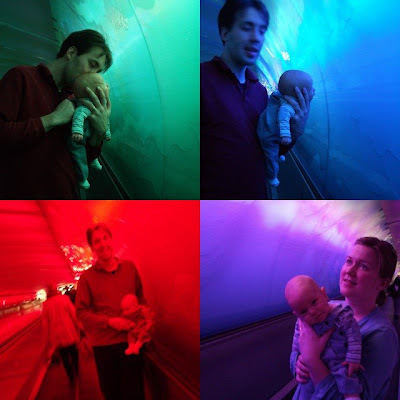 Plus, everyone really goes out of their way to help you out when you're travelling with an infant. A super-adorable infant. 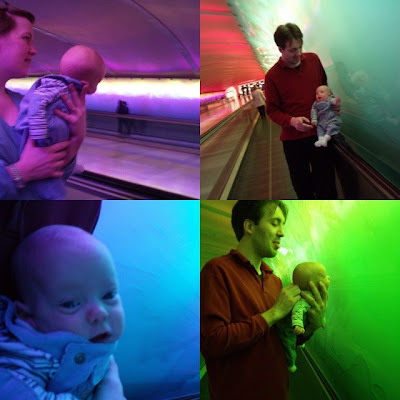 We had a 3 hour stop in Detroit and someone suggested we take him to the tunnel between the terminals. Music AND a light show. We walked up and down for nearly an hour and afterward, the regular lights in the terminals were just not as satisfying. We went out today with Nora and little Jack, the tax break wonderbaby, born during the closing hours of December 31. He's got a way with the ladies! Yesterday, we went shopping for some supplies for Ken's new office. A little girl - maybe six years old - was slyly following us around, trying to peek at the baby. She finally got up the nerve to come over and said, "We have a baby just like that at home...except her name's Megan." There has never been a smiley-er baby in the history of the universe.